62 cubic inch/3000 psi aluminum compressed air tank with built in "Myth" regulator. This is a must have upgrade since the air is regulated to a consistant pressure. Every shot is more accurate. The all-in-one revolutionary Myth regulator and tank system. High Pressure Air system that screws directly to your gun. It has a 3000psi aluminum cylinder with a pre-set output that gives you the look of a carbon fiber tank. The "Myth" is the regulator that is destined to take its’ place in Paintball, as the one that rendered all other screw-ins obsolete. * An astounding less than ¾” in length from ASA to bottle. * An unimaginable “Air-lite™” weight. * Replaceable head tip (for those accidental dings to the o-ring gland). 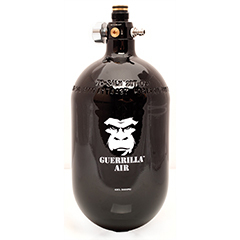 * All the same incomparable quality, safety, performance and support you have come to expect from Guerrilla Air™.